Students will be able to differentiate between renewable and non-renewable resources. Students will be able to classify resources as renewable or non-renewable. Begin the lesson by flipping off the light in your classroom. Explain that in a world without energy, many of the things we depend on every day—including lights, cars, washing machines, and phones—would not exist. Ask the class to explain what the word energy means. After some discussion, explain that EnergyRefers to the power created by the use of resources. Prompt the class to guess what the word RenewableMeans. Explain that renewable refers to something that can be replaced. Ask for a volunteer to tell you what the word Non-renewableMeans, based on the use of the prefix Non. If no one correctly defines it, explain that non-renewable refers to something that can't be replaced. 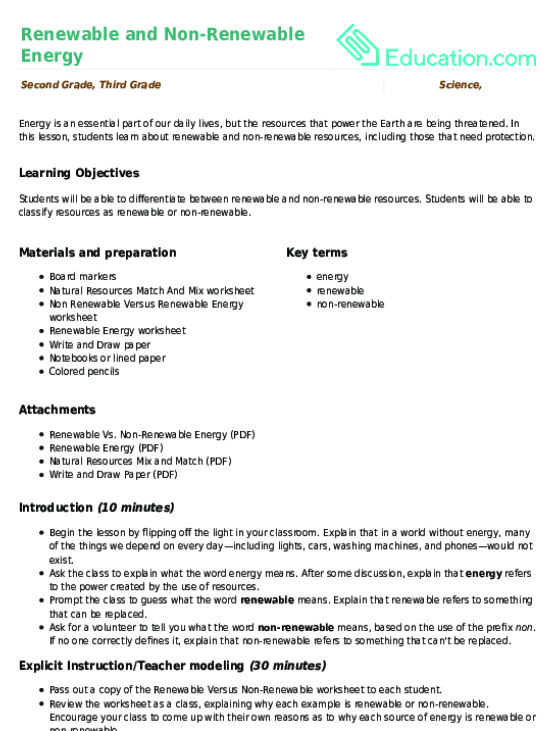 Pass out a copy of the Renewable Versus Non-Renewable worksheet to each student. Review the worksheet as a class, explaining why each example is renewable or non-renewable. 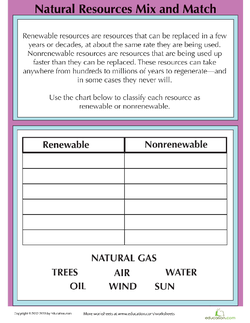 Encourage your class to come up with their own reasons as to why each source of energy is renewable or non-renewable. Once several students have shared their input, explain to the class why each type of energy is classified the way it is. For example: Solar energy is renewable since it comes from the sun. The sun provides energy every day for all living things, and it is inexhaustible. Petroleum is non-renewable, since there is a limited supply of it left on Earth. We use a lot of petroleum every day, in factories, in cars, and to heat our homes. Pair off students in groups of two, either assigning each a partner or asking them to find a partner to work with. Assign each pair the Natural Resources Match And Mix worksheet to complete together. 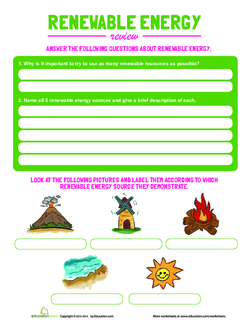 Ask your students to complete the Renewable Energy worksheet independently. As students work, walk around the class to answer questions and guide students toward the answers they're looking for through use of examples. Once everyone has finished, review the worksheet as a class. Enrichment:Ask your students to think of ten actions they do every day that requires either renewable or non-renewable energy. 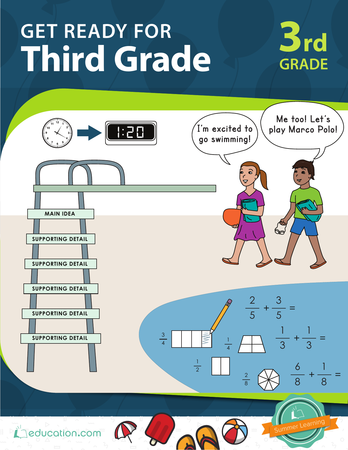 Have them write three complete sentences for each action. The first sentence should describe the action. The second sentence should describe the resources required to complete the action. The third sentence should state whether the energy used is renewable or non-renewable. An example could be drinking water as the action, water as the resource required and renewable as the energy required. Explain to your students that some actions may require both energies. 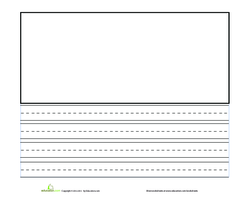 Support:Review the Renewable Versus Non-Renewable worksheet. 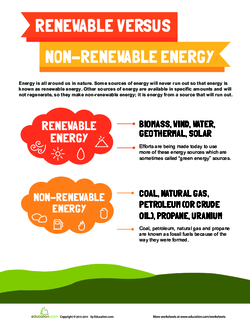 Describe some other examples of renewable and non-renewable resources. Ask your students to draw two columns in their notebooks or on a sheet of paper, and label the columns Renewable and Non-renewable. 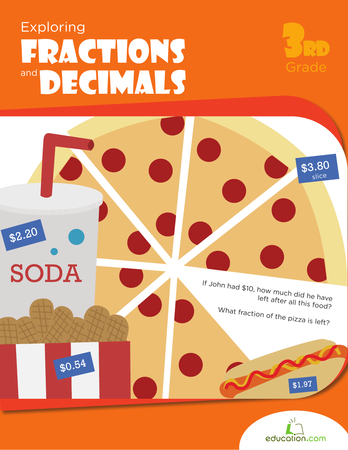 Ask your students to write the examples you discussed in the appropriate column. 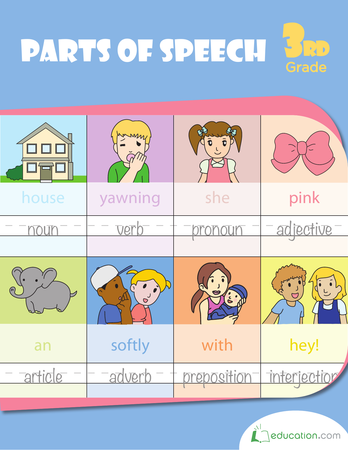 Give each student a piece of Write and Draw paper. 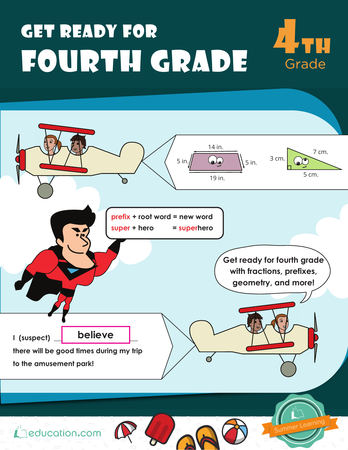 Instruct the class to write and draw one renewable resource and one non-renewable resource. Ask your students to share ways they use renewable energy every day. Great answers include: Drinking water, Taking a shower, and Riding a bicycle. Invite the class to share ways they use non-renewable energy each day. Great answers include: Heating their home, Riding in a car, and Cooking dinner.